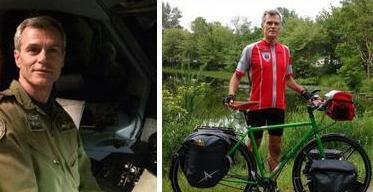 12164 John Dixon (Class of ’79) cycling for Wounded Warriors – Vancouver to Halifax (over 6,000 km). John Dixon has spent most of his adult years as a pilot with the RCAF for 25 years, as well as working for a number of aviation related civilian companies along the way. He has also been an avid cyclist, initially a mountain biker and transitioning more to road as the years have progressed. Now that retirement has caught up to him, he is now well on his way on a bike ride from Vancouver to Halifax, some 6,000+ kilometers. His route is pretty straight forward, of course, very challenging. Basically the Trans Canada through Kamloops, Revelstoke, Banff, Calgary, Moose Jaw, Winnipeg, he plans to dip down through the states and back into Canada at the Canadian Sault, Manitoulin Island, the ferry to Tobermory, Orillia, Peterborough, Ottawa, Montreal, Riviere de Loup, NB, NS to Halifax. The route, at this time, is NOT set in concrete – he is ‘toying’ with the idea of working his way through Trenton, Kingston to Ottawa. Stay tuned as we hope to provide updates through Aug and Sept.
Total of over 6000 km. I’ll make Calgary tomorrow. I’m riding for Wounded Warriors Canada. Also, all donations go to WWC as I am funding the trip myself. The “why” is stated on my Blog 1 at pedalpilot.net. His motivation for the adventure? His background in the military, and some limited knowledge of Post-Traumatic Stress Disorder (PTSD) led John to Wounded Warriors Canada (WWC) who have programs that help women, men and their families cope with life after service to their country. WWC’s stated mission is “to honour and support Canada’s ill and injured Canadian Armed Forces members, Veterans, First Responders and their families”. You can read about some of the great work they do here https://woundedwarriors.ca/. Their associated programs are truly inspirational, and more importantly, effective. Follow John and his 6,000 adventure at pedalpilot.net. The last time we checked he was East of Calgary.